Nintendo of America usually releases their major first party titles on Sunday in the U.S., however it looks like we’ve lucked out and get to relive what I believe is the best game in the Star Fox series a bit early. Star Fox 64 3D will launch on Friday, September 9th. It’s always nice to be able to play a game earlier than expected. I loved the original, and have very fond memories of playing it for hours at a time, collecting all the gold medals and unlocking all the nifty little multiplayer stuff along the way. Aside from the obvious graphic overhaul with 3D visuals, this version also features some pretty nifty multiplayer features as well. Oh! and who could forget about the gyroscope controls! So, are you guys excited about the early release? 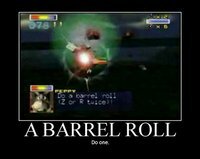 Which Star Fox game is your favorite in the series? Are you bummed about the lack of online multiplayer as well? Let us know!